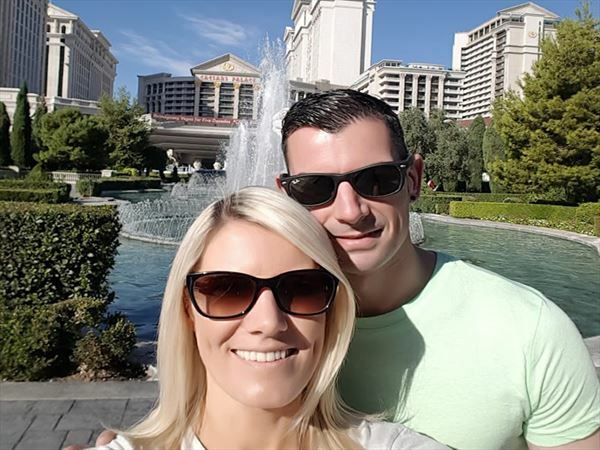 My husband and I travelled to Las Vegas at the end of October 2016. I chose to go to Las Vegas as a surprise for my husband's 30th . It was booked 5 months previously and what a surprise it was! 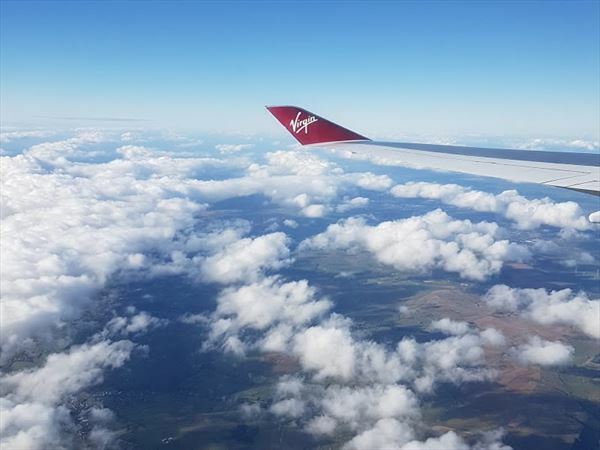 We travelled from Dublin to Vegas via Manchester on Virgin Atlantic. 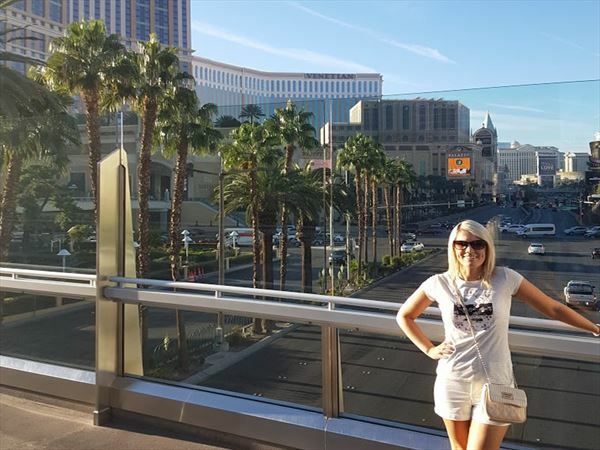 It was our first experience travelling with VA and indeed travelling to Las Vegas. The flight was smooth and very enjoyable with lots of entertainment and plenty of food and snacks along the way. When we reached Vegas, it was a short 20 minute wait in line for customs border control and another 10 minute wait for a taxi. We reached our hotel, The Wynn, within 10 minutes. The hotel has come as a recommendation from Roisin in American Sky and we were not disappointed. The moment we walked into the lobby, we were greeted with a friendly smile and welcome and had our bags taken from us to be brought to our room. Check in was swift and painless. I had done a lot of research on hotels on the strip, and not having been there before, I was conscious of wanting to be close to everything. The Wynn is a short and delightful 15 minute walk to the Bellagio (which I would say is in the middle of the strip). It may take longer if you pass through all the hotels which I would defiantly recommend! They are phenomenal. The Wynn itself is absolutely beautiful, with a large range of restaurants and entertainment to choose from. The design and architect was amazing. The luxurious room was bigger than my living room and bedroom at home! I walked into the bathroom and found it immaculately clean. The living area of the room was filled with couches, armchairs, a table, a huge super king size bed, a bar, and an immense entertainment centre. 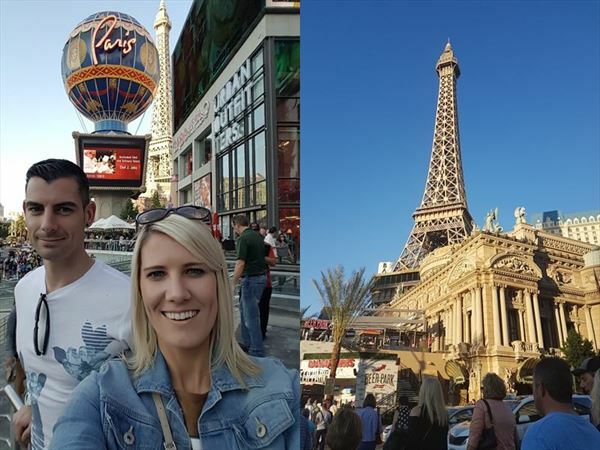 We had not made any itinerary or plan and decided to just go with the flow and most days we spent along the strip looking at all the hotels and restaurants. 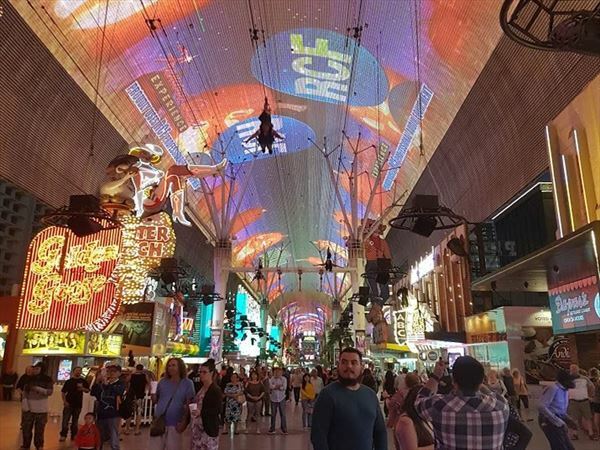 It was a sea of flashing fluorescent lights, buildings that seemed to touch the sky and people enjoying themselves the length of the strip. My jaw hit the floor numerous times. 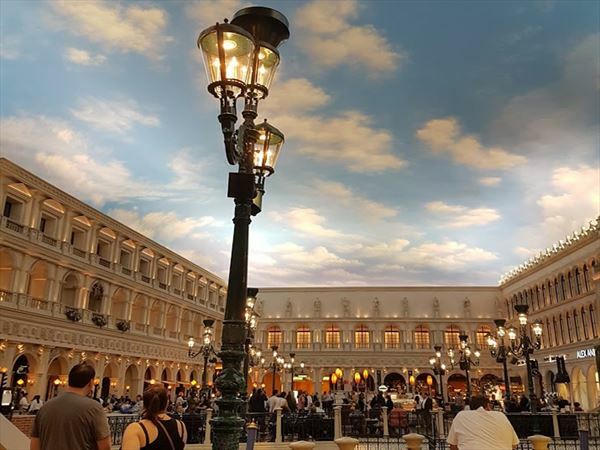 The Venetian, Ceasers, The Bellagio, Paris, MGM Grand – They are beautiful hotels and defiantly not to be missed! We had a long list of shows that was recommended by friends and the hotel. Our friend is lucky enough to live in Las Vegas and had told us that the show Le Reve The Dream (which was a show in the Wynn Theatre) was his favourite of all the shows in Vegas. 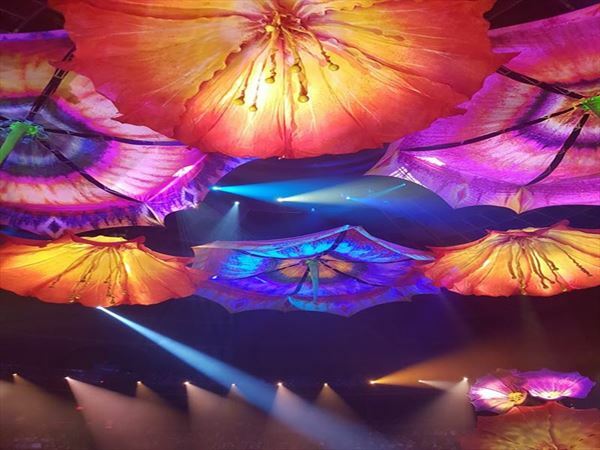 I have been to Cirque Du Soleil in a number of cities, seeing different shows and hands down Le Reve was the best show I have ever seen in my life! Take the time and go and see this show!! It was the biggest wow moment we had and the biggest highlight of our trip. Being big foodies, another big highlight was the vast range of restaurants to choose from. You will not go hungry in Vegas! We ate in Gordan Ramsey’s Burgr in Paris Hotel, the cheesecake factory, a number of pizza joints and of course not forgetting the Buffet at the Wynn. WOW! We travelling to the north shopping premium outlets on the bus (We had bought a 24 hour day pass for $8 but would defiantly recommend getting the 3 day pass as we ended up buying 24 hour passes on a number of occasions). They have a huge selection of your usual American stores, Abercrombie, American Eagle, Guess, Mike outlet etc. I found the shopping to be more expensive than previous years in the US but the dollar vs euro was not very favourable in October so we ended up buying some small things. Our biggest bargain was the Kate Spade store with 60% off everything and a further20% off at the till. There is another huge shopping mall right across from the Wynn, The Fashion Show Mall. Took quite a while to walk the length of it. Even if you are not buying, it is not to be missed! We took a short bus ride to Freemont, which is known as Old Vegas. Don’t be put off by the old and rundown buildings in the area. While down in the area, we went for a walk through the Old Nugget Hotel and stayed for the Freemont Light Experience show which is excellent and very well done. We wanted to do the zip lining but was told it would be a 3 hour wait so unfortunately didn’t get to experience that. If wanting to do this, it might be a good idea to do so early in the day instead of peak times. Overall the 4 days in Vegas was amazing, We ate incredible food, say beautiful sights and experienced unforgettable moments. I cannot wait to go back to Vegas in the future. My biggest tip for anyone going is to go with an open mind and carefree attitude! We would like to thank Claire & Derek for sharing their story with us and hope to welcome you on another holiday soon..